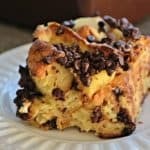 Chocolate Croissant Baked French Toast – mini chocolate chips, flaky croissants, cream cheese combined with a sweetened egg mixture make the perfect overnight breakfast. Make it the night before and it will be ready to eat after baking in the morning. It’s chocolate for breakfast! 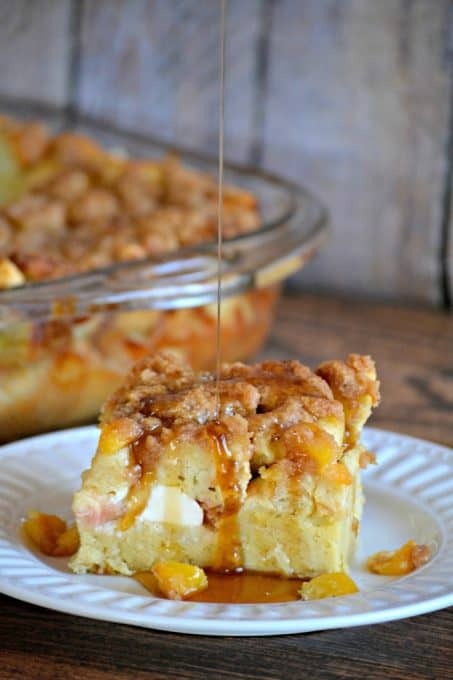 We’re going to make this a short post today and get right to the recipe. Mainly because I have nothing to talk about. It’s not often that that happens, so enjoy it while you have the opportunity. Usually, I’m long-winded and can go on and on when I’m writing. 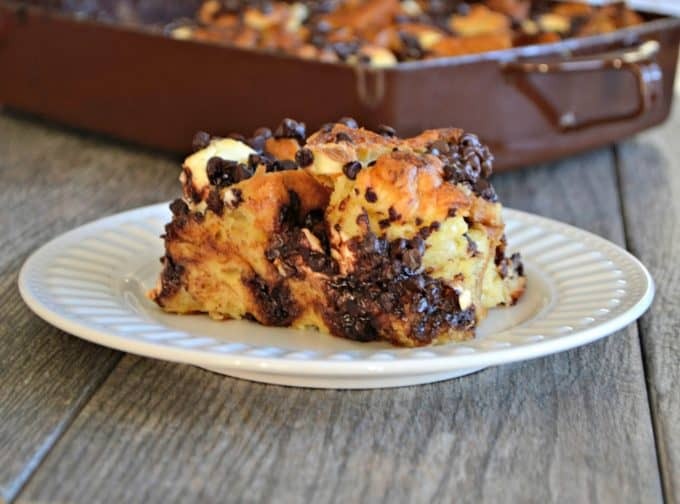 Chocolate Croissant Baked French Toast is chocolate, croissants, and cream cheese soaked overnight in an egg mixture. It's a delicious overnight breakfast. Prepare a 9 X 13-inch baking dish by spraying it with cooking spray. Cut the croissants up into bite-size pieces or 1-inch cubes. Layer half of them into the prepared pan. Sprinkle half of the mini chocolate chips over the croissants. Cut the cream cheese into small squares by dividing it in half and slicing into 20 pieces. Distribute half of the cream cheese over the croissants and chocolate chips. 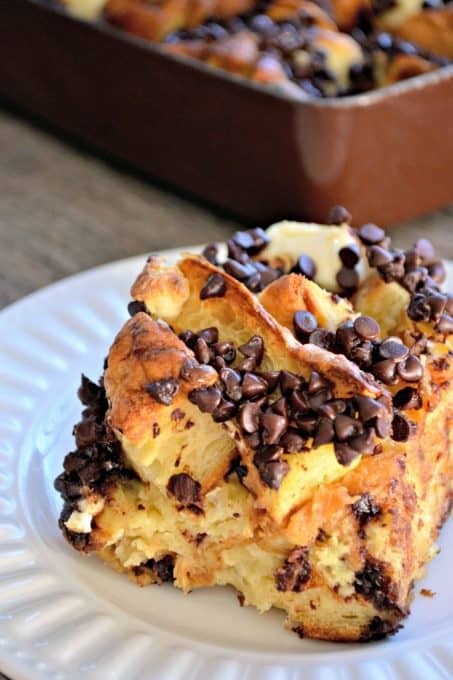 Place the remaining croissants, chocolate chips and cream cheese into the pan. In a large mixing bowl, whisk together the eggs, milk, heavy cream, sugar, vanilla and salt until thoroughly combined. Gently pour and evenly distribute the egg mixture over the entire pan. When ready to bake in the morning, preheat oven to 350 degrees F and remove plastic wrap. 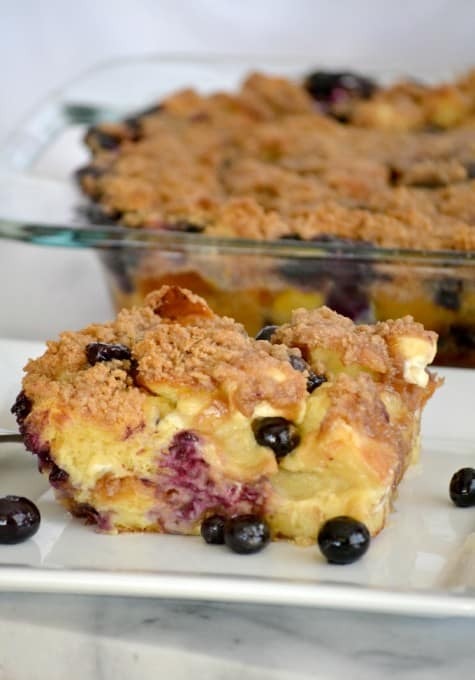 Bake for 45 – 55 minutes. 45 minutes will give you a softer, slightly unfinished middle whereas 55 minutes will be firmer. 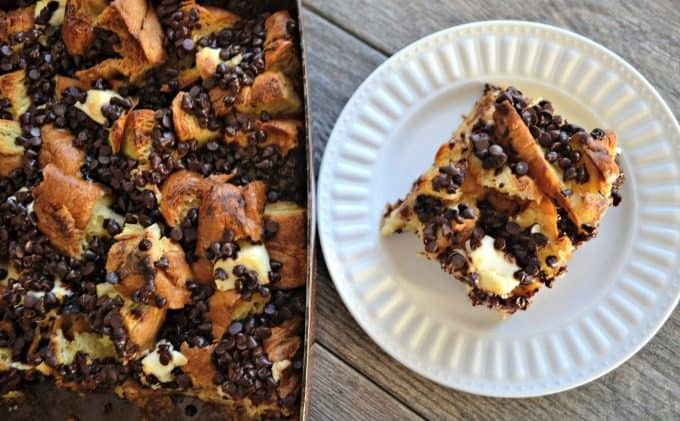 If you like this Chocolate Croissant Baked French Toast then you’ll enjoy..
Oh my, this looks so good! Those chocolate chips are seriously calling my name. ? Are the croissants already cooked? you buy ready to eat croissants? Yes, Amanda, I purchased them at Walmart, already baked. You can also substitute a challah bread if you’d like and you’ll need about 6 cups of cubed bread, so one loaf would be fine. I used this recipe but substituted challah bread for crossaints. Soo so good – everyone loved it. I hcut back on the cream cheese because although I like it I am not crazy about it. Definitely will be making this again! Thanks! Oh, Helen, that’s so wonderful to hear! Thank you so much for letting me know. I’m so very glad you liked it. 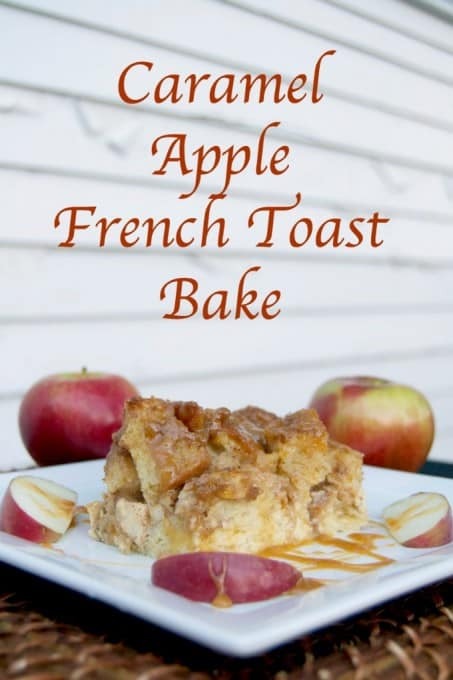 I love making my baked French toast recipes with challah; it just makes them SOOOOO good! Becky, thanks so much. I really appreciate that! This recipe looks delicious, but I was wondering if I could substitute the heavy cream with regular 2% milk. Thank you. Ally, you can replace the heavy cream with milk as I’ve seen other Baked French Toast recipes made that way. I have never done it, so not sure how the outcome would be, but I found this post which might help guide you if you need to make any additions to the batter. Hope it helps! How do I pin this? Cheryl, you just have to hover over the picture and the red Pin it button should come up. IF not, there’s a Pinterest icon on the left side of the screen to click.